Controversial radio-pundit-turned-Senate-aide Jack Hunter’s work caught the eye of the Paul family years before he was hired as Sen. Rand Paul’s (R., Ky.) social media director, Hunter told the Washington Free Beacon in a Monday interview. The Free Beacon reported on Tuesday that Hunter, 39, worked as a pro-secessionist radio pundit known as the "Southern Avenger" for nearly a decade before he was hired to help pen then-Senate-candidate Paul’s book The Tea Party Goes to Washington. Hunter has worked in Paul’s office as his social media director since 2012. 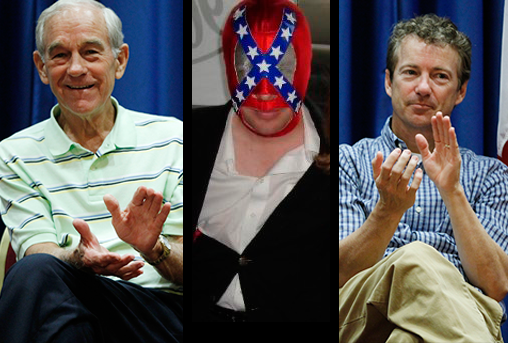 The news of Hunter's association with the League of the South, which advocates secession, and the content of Hunter's commentaries and YouTube videos wearing a wrestling mask emblazoned with the Confederate flag, sparked widespread criticism of Senator Paul, who has said he is interested in running for president in 2016. Hunter described how he first became close with both Rand Paul and his father, former Rep. Ron Paul (R., Texas), in an interview with the Free Beacon on Monday. Hunter also renounced comments he had made as a radio pundit between 2004 and 2008, ranging from his support for Abraham Lincoln’s assassin to his claim that the U.S. atomic bombing of Hiroshima and Nagasaki was the worst terrorist attack in world history. He refused to directly renounce his support for secession but said it was a "dead letter issue" in modern politics. Paul’s office indicated late Tuesday that the senator would stand behind Hunter. "Our office policy is that all employees treat individuals with the equal protection of the law. We find no evidence that this policy has been violated by any employee," said spokeswoman Moira Bagley in a statement. In a statement on the Southern Avenger website on Tuesday, Hunter said the report of his "not-very-hidden radio pundit background … does not accurately reflect me or my full, or true, views." "The role of a radio host is different from that of a political operative," Hunter wrote. "In radio, sometimes you’re encouraged to be provocative and inflammatory. I’ve been guilty of both, and am embarrassed by some of the comments I made precisely because they do not represent me today. I was embarrassed by some of them even then." He also lashed out at Tuesday’s Free Beacon report, saying, "Not surprisingly, the reporter chose not to balance her piece" by citing columns Hunter wrote "promoting African-American history and politics, and many other writings." Hunter first came to know Ron Paul during his 2008 presidential run when he was known for his South Carolina radio commentary under the moniker the "Southern Avenger." At the time, Hunter had started posting his radio commentaries onto YouTube and was gaining a large following in libertarian circles. The then-pundit introduced Ron Paul at South Carolina political rallies, he told the Free Beacon. "I was a talk radio guy who had a lot of those libertarian views, who sort of coincided with this guy who was running for president who also had those views. It was sort of right place right time," Hunter said. Hunter said Rand Paul was already familiar with his work when he hired him to help write his 2011 book. "[Paul] decided that he wanted to work with me, and he’d watched, he’d paid attention to some of my work," he said. "The publisher told me there was a list of other writers who could help with this who were more experienced than I was," Hunter said. "I’ve always wanted to see that list to see who I beat out. But he chose me." It remains unclear whether Rand Paul was familiar with Hunter’s inflammatory radio punditry when he hired him. A representative for Paul did not respond to a request for comment. Hunter said he forged a close relationship with the younger Paul while working on his book. "I consider the senator a friend," Hunter said. "I consider his father a friend. And I work for [Rand Paul], as I did his dad. We would spend long amounts of time in the campaign van in Kentucky because I was gathering material for the book. I interviewed his wife Kelly and did all sorts of personal anecdotes, so I spent a lot of time around gathering information." After the younger Paul was elected to the Senate, Ron Paul hired Hunter as a blogger and political consultant on his 2012 presidential campaign. Hunter said the elder Paul was a fan of his YouTube commentary. "Ron would say, ‘This is Jack, he makes great videos.’ And he’s talking about YouTube," Hunter said. The Paul campaign touted the new hire in a July 2011 press release headlined "‘Southern Avenger’ signs on to blog, energize voters." "Jack Hunter is one of the nation’s foremost conservative commentators and his signing onto the campaign as blogger will be a great help in spreading Dr. Paul’s message of limited government and individual liberty," said Ron Paul 2012 spokesman Jesse Benton in the statement. Hunter also gave an address at Ron Paul’s Campaign for Liberty conference in October 2011. "I still am the Southern Avenger. I haven’t exactly dropped it, so that’s okay to always use that," he said in the speech. His work for Ron Paul’s presidential campaign appears to have overlapped slightly with his work for Rand Paul’s office. He is listed on the Ron Paul presidential payroll for "Consulting- Political Strategy" work from July 29, 2011 until Sept. 14, 2012, earning $65,000, according to FEC filings. He joined Rand Paul’s payroll on Aug. 1, 2012, and was paid $40,000 between then and March 31, 2013, according to LegiStorm. Hunter said his work for Rand Paul largely consists of social media outreach. He disputed reports that he is part of a circle of staffers who advise the senator on foreign policy. "We talk about the issues of the day, what’s in the news," Hunter said. "I think it’s a misrepresentation to call me a foreign policy adviser. One would have to be an expert in the field to be an adviser, right? I’m a political guy." Hunter said that when foreign policy issues come up, "I give my two cents. Whether [Paul] listens to it or not is a completely different story." Senator Paul became the subject of harsh criticism after Hunter's views gained notoriety. "Suffice it to say, if anyone in Paul’s office knew of this man’s background then Paul has a serious problem on his hands," wrote the Washington Post’s conservative columnist Jennifer Rubin. "And if no one bothered to vet Hunter, then concerns about the close-knit, amateurish staff will heighten." At the Daily Caller, Matt Lewis wrote that "arguably the most damaging part of the story comes toward the end, where Hunter seems to confess that Rand Paul is in the process of conning the pro-Israel lobby, neoconservatives, and other mainstream conservatives." Salon, the Huffington Post, and other left-leaning outlets also seized on the story. "There are certain thing, certain views that put you outside of the boundaries of being listened to on anything," said MSNBC "All In" host Chris Hayes. "I’d say white supremacy is one of those, and association with people that hold those views or endorsements of feature of those views—well, they render you unfit." The revelations about Rand Paul’s close aide could pose a serious problem for his 2016 presidential ambitions, political analysts said. "This guy makes Paula Deen look like the chair of the NAACP," Larry Sabato, director of the University of Virginia’s Center for Politics, told the Courier-Journal. Norman Ornstein, a resident scholar at the American Enterprise Institute, told the Courier-Journal that if Rand Paul "is really serious about aggressively pursuing a presidential race, he cannot keep a guy around as a very close aide and co-author of his book with this kind of a background." Matt Berman at the National Journal wrote that the news "isn't just a problem for Hunter, who renounced much of what he had written and said in an interview with the Free Beacon. It's a problem for Rand Paul, who seems to have a consistent problem with being overshadowed by the far-right political fringe." "In all likelihood, Jack Hunter will be going away," Berman wrote. "The radical cloud hovering over Rand Paul will not." This entry was posted in Politics and tagged Congress. Bookmark the permalink.